Vaccinations stave off 26 potentially deadly diseases, the United Nations health agency is emphasizing on the first day of World Immunization Week, which also marks the halfway point of the Organization's goal to stop millions of deaths from vaccine-preventable diseases. Vaccines are one of modern medicine's major success stories – tackling infectious diseases by making people immune or resistant, stimulating the body's own immune system – having prevented at least 10 million deaths between 2010 and 2015, stresses Dr. Margaret Chan, the Director-General of the World Health Organization (WHO), in a press release. At the same time, the full potential of vaccines is still not fully utilized, underlines the UN health agency, reiterating that when immunization rates are high, the wider community is protected, including infants who are too young to receive their vaccines, older adults at risk of serious diseases and people who take medication that lowers their immune systems. WHO warns that the target of all 194 countries that signed the agency's global action plan to eliminate vaccine-preventable diseases by 2020 is behind schedule. The list with preventable diseases includes measles, rubella, and maternal and neonatal tetanus. WHO reports that by increasing immunization globally, the lives of an additional 1.5 million people could be saved every year. This year, Immunization Week falls at the halfway point of completing the target set by the Global Vaccine Action Plan to eliminate vaccine-preventable diseases. The goal of the plan is to improve the health of all people by extending the benefits of immunization through more equitable access to vaccines. According to the WHO latest numbers, an estimated 19.4 million infants worldwide were not reached with routine immunization services such as Diphtheria-tetanus-pertussis (DTP3) immunization coverage. In one of the Immunizations Week messages, Dr. Chan speaks on behalf of the world's children, who should be a prime concern of all societies, saying that “no child should be denied the right to immunization for unfair reasons, including economic or social causes." The WHO director adds that “all barriers must be overcome." Of the 19.4 million children without lifesaving DTP3 immunization about 11.5 million of them live in 10 countries, namely Angola, the Democratic Republic of the Congo, Ethiopia, India, Indonesia, Iraq, Nigeria, Pakistan, the Philippines, and Ukraine. The goal of all 194 GVAP signatories is to achieve vaccination coverage of at least 90% nationally and at least 80 per cent in every district by 2020. 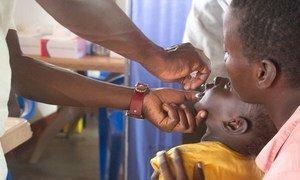 More than 116 million children are set to be immunized against polio starting tomorrow in one of the largest of its kind synchronized vaccination campaigns across west and central Africa, United Nations agencies today announced.